WASHINGTON – Some of these wildfires have turned into large incident and may be in separate posts. Please stay with us and read what is happening in the Northwest. Though fire season has been full on for the last few months, things are now imploding with a few of them turning into firestorms. This is for the State of Washington Only. As we play catch up, updates on Oregon’s worsening fire conditions and the many fires they are experiencing. Idaho is also being impacted as well. #NineCanyonFire – Nine Canyon Road. Dispatched @ 1551 hours. Grass, brush, timber and snags. 10 acres. IC Captain 160. #SlideFire – Field’s Point Landing. Dispatched @ 0535 hours. Grass and brush. 2 acres. Fire contained at 0902 hours and under control at 1416 hours. #PendrySpotFire – Perry Wilderness. Dispatched @ 1718 hours. Grass, brush and snags. HI-144 and HI-148 resources. 0.1 acres. In patrol status. #AmabilisMountainFire – Amabilis Mountain. Dispatched at 1746 hours. Grass, brush and timber. E-332 and SE-461 resources . IC as of 2003 hours. 0.2 acres. #MoreheadSpringFire – Morehead Spring. Dispatched @ 1351 hours PDT. Grass, brush and timber. 0.1 acre. IC Cline. #Highway20SpotFire – Newport. Dispatched @ 1416 hours. Grass, brush and duff. 0.01 acre. In patrol status. #UpriverBeaconFire – Upriver Drive. AA 444TS AR 25 AR 28 AR 31 AR 32 AR 440 AR 441 AR 444 AR 445 AR 448 BC 31 DNR 33 FB 201 FB 202 FB 206 FP 10 FP 16 H 346 HT 41 HT 43 T 837. IC AR 25 (@ 1722 hours). Grass, brush, reproduction and light timber. Resources on-scene at 1608 hours. 75 acres and growing. 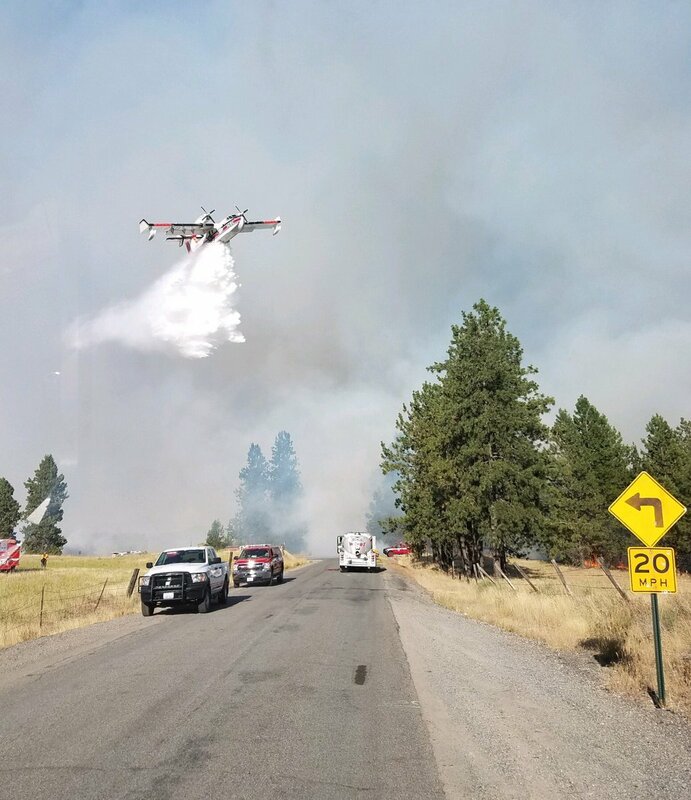 #ReflectionLakeFire – Elk-Chattaroy Road. Dispatched at 1427 hours. AR 26 AR 414 AR 422 AR 442 HT 42 LOA 34 on-scene at 1439 hours. Grass, brush, slash, reproduction and timber. 1.6 acres. SMOKE CHECK – Riverside State Park – Indian Trail. Dispatched @ 2021 hours AR 26 AR 443 E 562 H 346. #GreenWoodLoop. Dispatched @ 1551 hours. NC 341 @ 1637 hours. Additional resources on-scene as of 1559 hours. #ChinaBendFire – China Bend. Dispatched 0721 hours. Resources on-scene at 0800 hours. IC at 0833 hours. Unknown results. #AndersonLakeFire – Anderson Lake, Yelm. Disaptched at 1239 hours. IC Wilkins. Unknown results. #140AveFire – 140th Avenue in Rochester. Dispatched @ 1200 hours. Resources include CARLSEN E262 E801 HANLIN JEWELL KNUTZEN OLSON RICKS SIMMONS and ANDERSON (IC). No details. #DoddRoadFire – Dodd Road. Dispatched @ 1914 hours. Unknown fire fuels. No resources on the incident. #CoalCreekFire – Off of Hwy 542. Dispatched at 0830 hours. Slash, brush and timber. Contained and brought under control at 1040 hours. In patrol status as of 1130 hours PDT.